I got up a little extra, extra early this morning and decided that I was awake enough to navigate needle and thread. 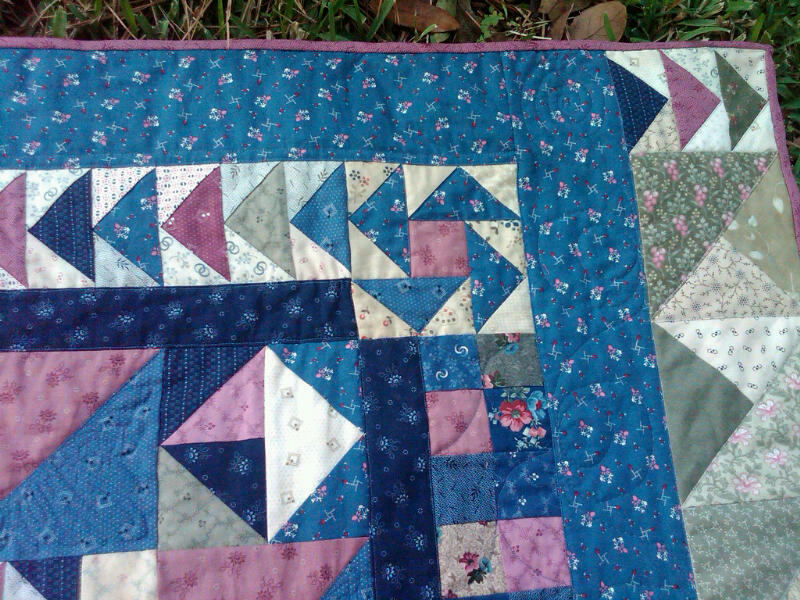 All I had left was the binding on my Forget Me Not quilt and I had about 2 hours to get it done. Once those kids are awake, there’s no sittin’ still. So… I DID IT! So happy! So glad! An actual finish to a project!! Are you ready for the pictures? 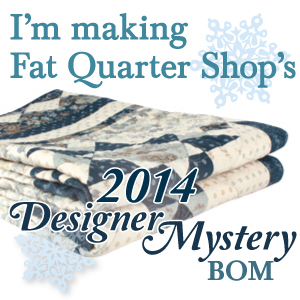 If you recall, this started as a sew a-long blog party from Pam Buda of Heartspun Quilts. 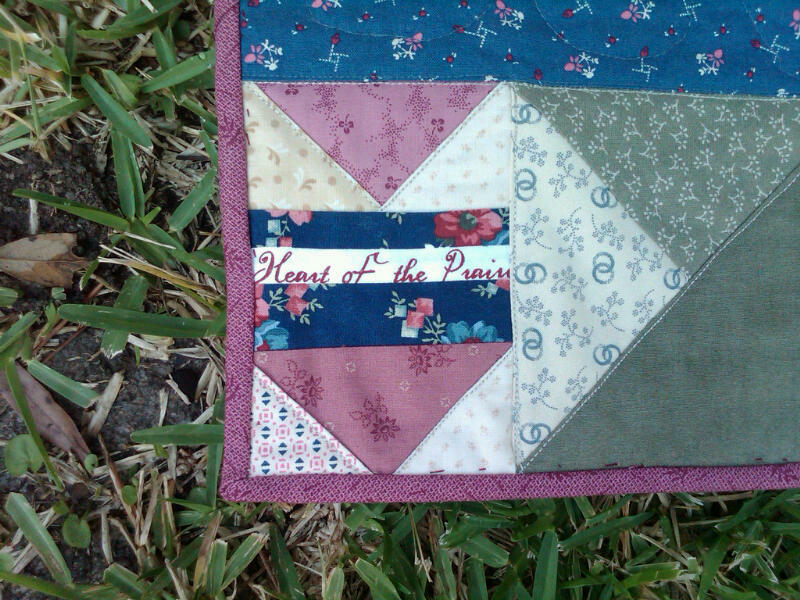 The future quilt name was Forget Me Not, and I had elected to get the fabric kit for the ‘miniature’ quilt from Pam that included her new collection of fabric called Heart of the Prairie. Each week, for 8 weeks, we received the instructions to complete up to 2 of the blocks for a total of 12 unique 5″ unfinished blocks and 12 half-square triangle blocks to go between them. 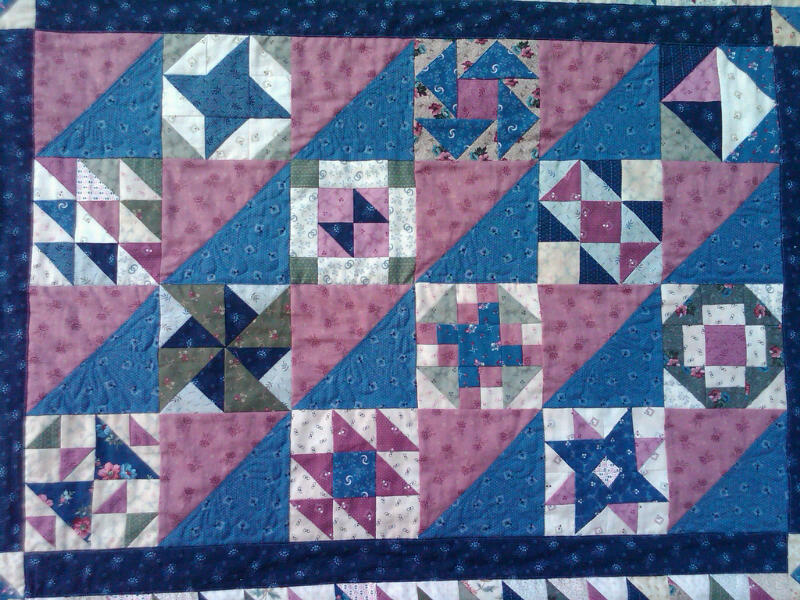 How we finished the quilt after that was up to us. 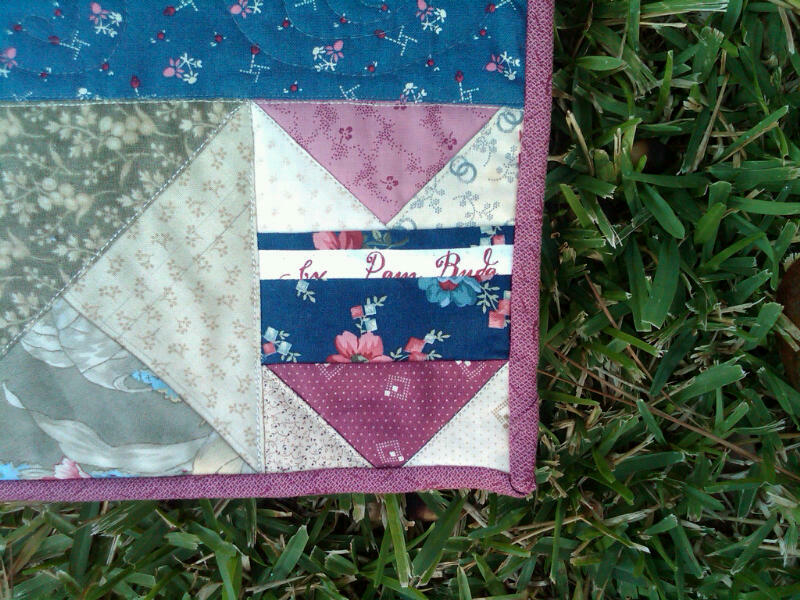 You can find earlier posts on this quilt project from my tag “Forget Me Not”. My goal was to try and use up every bit of the fabric that I received in Pam’s kit (which there was still a LOT left over luckily) and end up with a table runner as a birthday gift for my mom. 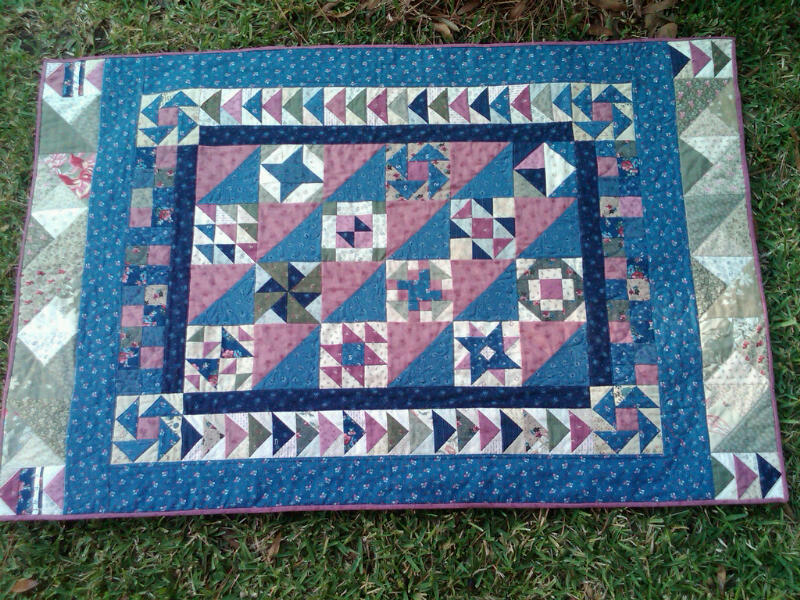 And below is my completed quilt. 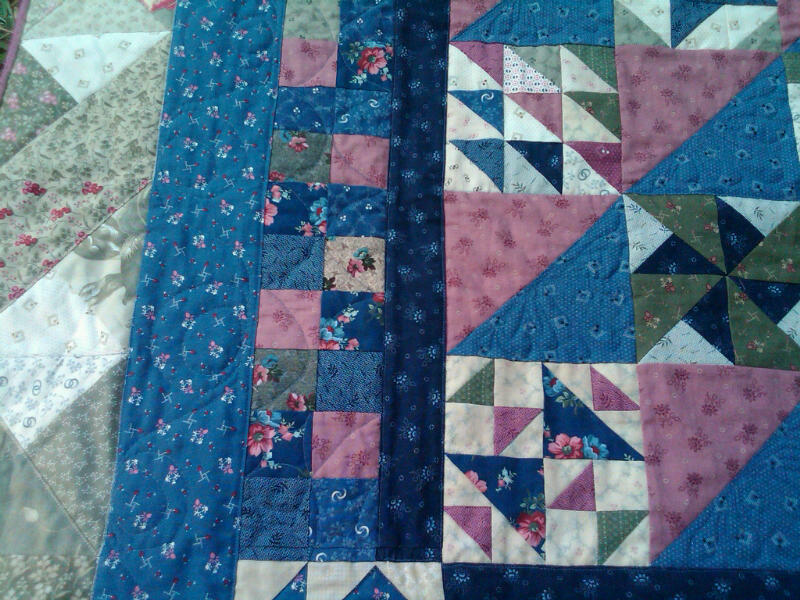 I did add on those extra pieced end borders of the mossy green and neutral fabrics, thinking that it would blend better. I had enough backing fabric to do it and I wanted it longer to emulate a table runner. I should have included some blue fabrics into that design element, because I think it just kind of sticks out now. Additional note: I had to supplement with a charm pack from Cinnamon Spice (those mossy greens) and Everlastings (some of the neutrals) to get it all done, but I would say that 90% of the fabric is from Pam’s collection. Here are a few closeup shots. Detail from the other side, with opposing flying geese units. So – there it is! Just need to create a quick quilt label and stitch it to the back and it will be delivered to my mom the next time I see her. Happy Birthday Mom! Finally, another show-n-tell courtesy of my very nice neighbor, Carol. 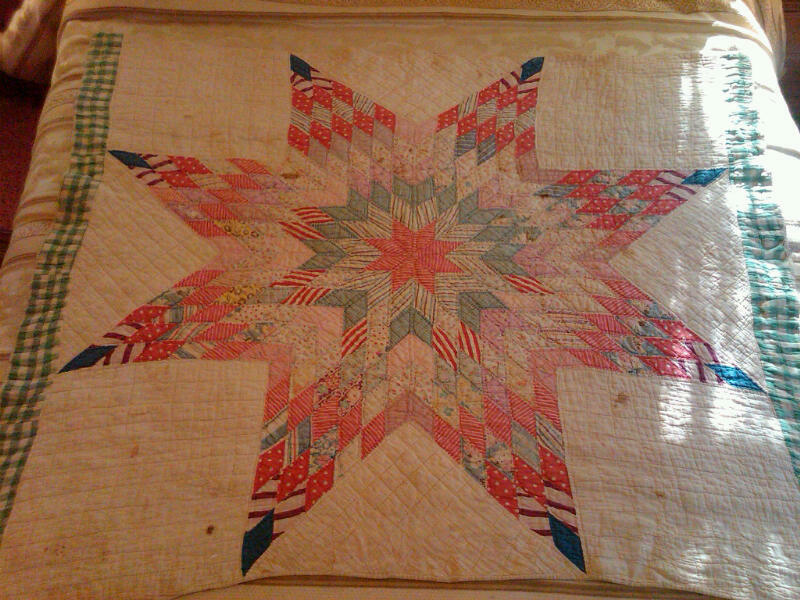 She stopped by a couple of weeks ago to pass along this star quilt. She doesn’t remember exactly where she got it. Her best guess was an estate sale at some point. 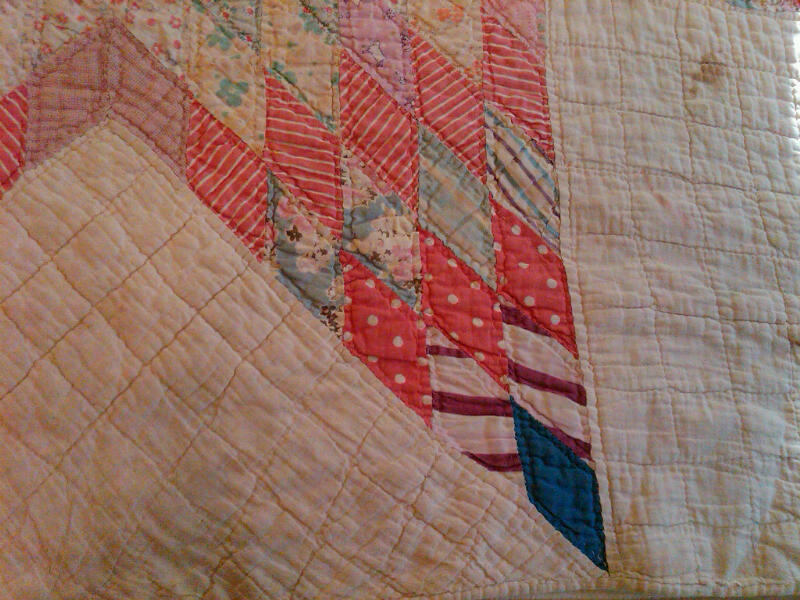 I have no idea how to age quilts, but it is very soft, and does obviously show wear. 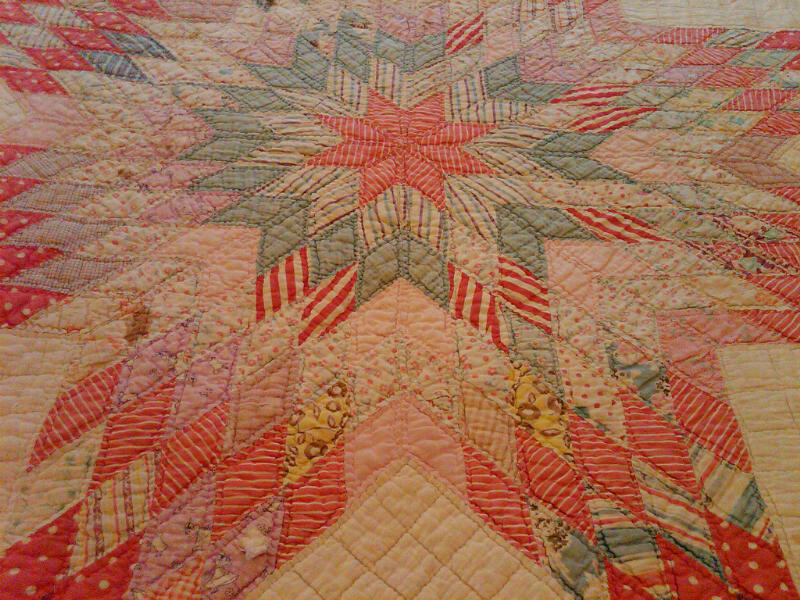 But it is quite stunning in the workmanship and I was honored to receive it from Carol. 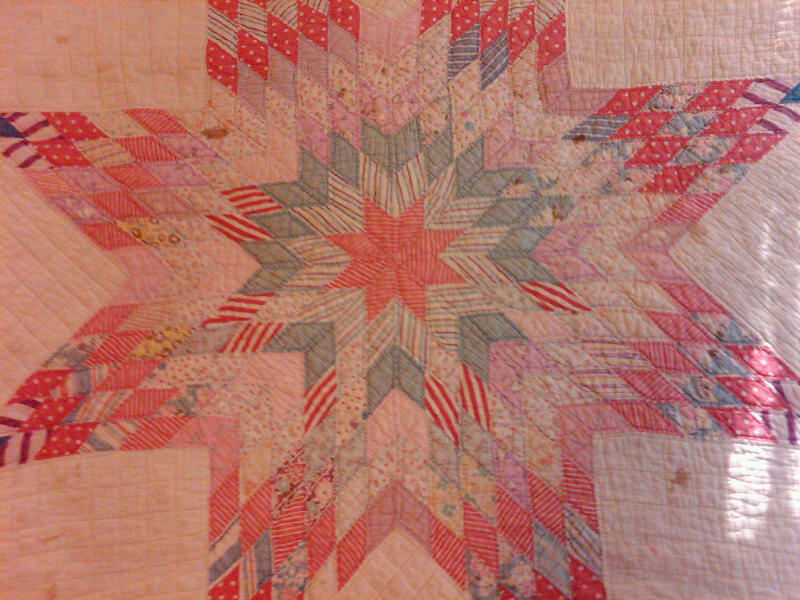 She didn’t have a good use for it and thought I would like to have it since she knew I was a quilter. Thank you Carol!! Jennifer, I couldn’t find your email address but wanted to thank you for your ebay tip, I took the plunge and bought some yardage, I sure hope it shows up! I guess quilters buy and sell fabric on ebay all the time, it’s new to me. I’m glad I stopped by, congratulations on finishing your Pam Bouda sew along project, I love the outer border you added, great job. I’m sure your Mom will be thrilled.